My best friend Bandit, a 12 year old German Sheppard, passed away last night. I swear you could talk to him just like a person and he understood what you said. I got Bandit when I was 14 years old. He was the alpha male, big and strong with an attitude to match. During the day Bandit stayed at home with my grandmother while I was at school and my parents at work. He would get mad and tear stuff up when everyone left in the morning to let us know about his displeasure. He had an eye for the expensive things. Remote controls, schoolbooks, reading glasses and video games were among those items he used to make his point. I came home from school one day to find my dad standing in the doorway at home and looking absolutely furious. "Do you know what your dog did today?" he asked me. It turns out that Bandit bypassed the usual suspects on this day and went for something he knew would get out attention...a five pound bag of flour. You could see little piles of flour around the house where he would stop in one place and shake the bag around. Even after cleaning up all the mess we could see it was weeks before you could sit on the sofa without a white cloud of flour fly out. I was so mad when it happened but as time went by it became my favorite tale of my best friend. Nice blog ! I like your article and i will really read it again.. I know the pain you must be feeling. I just lost my 10 year old, Anika, in March. I never ceases to amaze me the antic these dogs pull. They are so witty one might think we are talking about young children. That is what makes us love them so much. 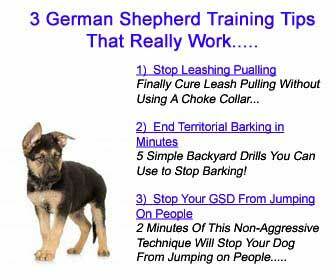 That is what makes us German Shepherd people! I am sorry you lost your friend. 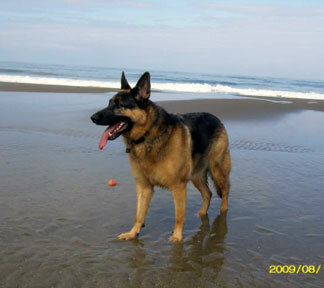 What a beautiful story you have shared with the German Shepherd Loving Community. I am so very sorry for your loss. You were blessed to have him so many years. I am including a statement that has comforted me and many others that have lost their dearest friend. I hope it can bring you some kind of comfort as well.